At the same time an extensive number of demonstrations were also taking place in the Institute of Atomic Physics and Spectroscopy. There were several of them utilizing computer vision. In the image above you can see a demonstration of blood perfusion in the palm using rPPG principle and back-projected image on the actual hand in real time. This was achieved using a near-infrared and a thermal camera to capture the temperature and positioning of the palm. UL SPIE Chapter members Marta and Matīss exploring the effects of various image components captured by a computer webcamera: same image displayed in regular three-color image, G (green component), B (blue) and R (red) in order to show the combinations, effects and possibilities of each color channel. Here visitors could see how a computer recognized faces in a video as well as get their pulse measured using just a web camera and a specially written computer program. This technology is called non-contact photoplethysmography. It counts small color changes in the skin caused by a person’s heartbeat which are not visible to the naked human eye. 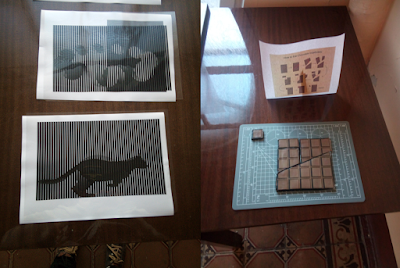 Above are some optical illusions that were demonstrated by UL SPIE members Andra Pirktina and Inga Brice. On the left - moving picture illusions. Visitors were very interested in how to make such images themselves. On the right - infinite chocolate illusion. Inga pointed out that almost everyone had heard of this illusion but hardly anyone knew how it worked and the most often asked question was - “Is the chocolate real?" Visitors were also introduced to a project being conducted in the institute and in simple terms informed about sensors and Whispering Gallery Mode resonators, a simple demonstration visible on the left. On the right side image pixels of a smartphone screen where magnified until they could be easily distinguished. 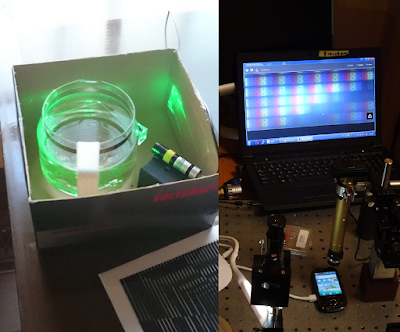 Last, but not least, also UL SPIE Chapter prepared a fun photo-booth called “Shine like a Photon’’ where each visitor could observe types of luminescence: photoluminescence and phosphorescence - trying out the effect of UV radiation on different materials, fabrics and colors in real and fun way.